Hi, thank u for ur comment, please follow me first & i follow back. I like green! I follow you! Regards! Fantastic!! Love those bright colours! Nice colours for spring/summer! You have a lovely blog! I like your blog, and I started to follow you. Awesome colors! Would you like to follow each other? 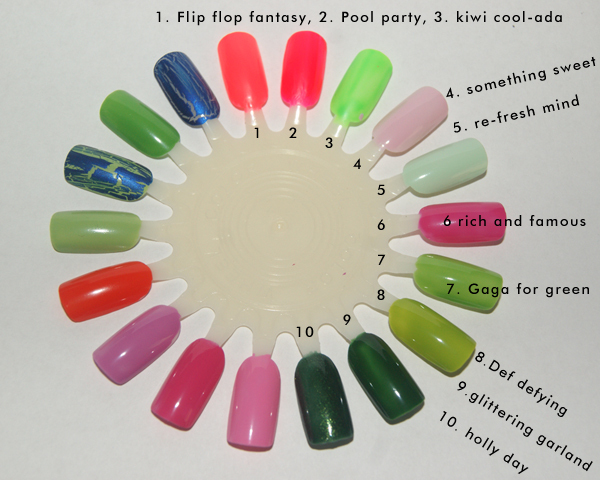 I love pool party, perfect colour for spring!! Loving all the bright colors, fun for summer. pasate por mi blog que estamos de super sorteo! Die drei Lacke oben gefallen mir am besten, wunderschöne Sommerfarben! wow! re-fresh mint ist der knaller. brauch ich unbedingt :) hab die noch nirgendwo gesehen, wo hast du sie her? <3 tones. die 3 Neonfarben sind der Knaller..wow..! Ich steh ja total auf so Töne, jetzt wenns wärmer wird und im Sommer sowieso!